Among the most commonly used and widely distributed are the Kalashnikov series of assault rifles (AK-47 & AKM ) used by all of the countries in the former Soviet Union. Soviet pistols and rifle grenades have also been widely sold around the world and have fallen into the hands of insurgent groups through theft and barter. Several terrorist rogue states have also provided these weapons directly to insurgent groups in large quantities. 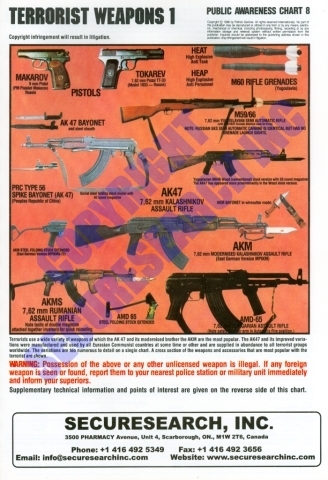 This poster provides awareness and recognition recall for anti-terrorism forces.